This Place of Worship was founded after 1921, though it is now closed, but we don't yet know when, and the premises are now in secular use. St Peter & St Paul's Mission is on High Street West on the right from Dinting into Glossop. It is just past Glossop Service Centre, before the turning into Hugh Street. The latter appears to be a private access-only road, marked as such on the side of the house on the corner with the main road. As it is dedicated to St Peter and St Paul (labelled by the submitter as such), I'm assuming it was an Anglican Mission. The only appearance of the building on Old Maps that I've been able to locate is in 1921, when it is marked as a "Club", so I have assumed it was consecrated after that. 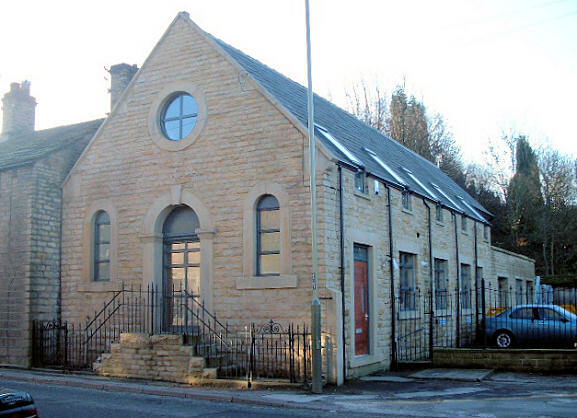 St Peter & St Paul's Mission, Glossop shown on a Google Map. Information last updated on 29 Jul 2013 at 12:11. Please also remember that the former St Peter & St Paul's Mission is understood to be in secular use, so care should be taken to preserve the privacy of its occupants. This Report was created 8 Apr 2019 - 17:34:54 BST from information held in the Derbyshire section of the Places of Worship Database. This was last updated on 6 Feb 2019 at 15:49.